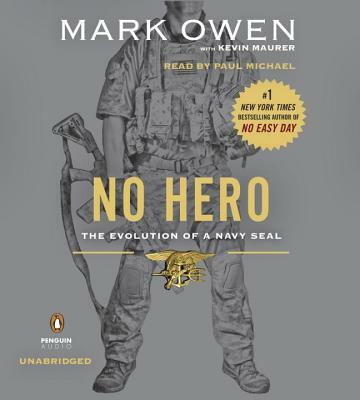 While Mark Owen's instant New York Times bestseller No Easy Day focused on the high-profile targets and headline-grabbing chapters of the author's career, No Hero will be an account of the most personally meaningful missions from Owen's thirteen years as a SEAL, including the moments in which he learned the most about himself and his teammates, in both success and failure. Mark Owen describes his intentions for his second book best: "I want No Hero to offer something most books on war don't: the intimate side of it, the personal struggles and hardships and what I learned from them. The stories in No Hero will be a testament to my teammates and to all the other active and former SEALs who have dedicated their lives to freedom. In our community, we are constantly taught to mentor the younger generation and to pass the lessons and values we've learned on to others so that they can do the same to the guys coming up after them. This is what I plan to do for the reader of No Hero." Every bit as action-packed as No Easy Day, and featuring stories from the training ground to the battlefield, No Hero offers readers an unparalleled close-up view of the experiences and values that make Mark Owen and the men he served with capable of executing the missions we read about in the headlines. MARK OWEN is a former member of the US Naval Special Warfare Development Group, commonly known as SEAL Team Six. In his many years as a Navy SEAL, he has participated in hundreds of missions around the globe, including the rescue of Captain Richard Phillips in the Indian Ocean in 2009. Owen was a team leader on Operation Neptune Spear in Abbottabad, Pakistan, on May 1, 2011, which resulted in the death of Osama bin Laden. Owen was one of the first men through the door on the third floor of the terrorist mastermind's hideout, where he witnessed Bin Laden's death. Mark Owen's account of the raid, in No Easy Day, remains the only accurate eyewitness account on record. KEVIN MAURER has covered special operations forces for nine years. He has been embedded with the Special Forces in Afghanistan six times, spent a month in 2006 with special operations units in East Africa, and has embedded with US forces in Iraq and Haiti. He is the author of four books, including several about special operations.